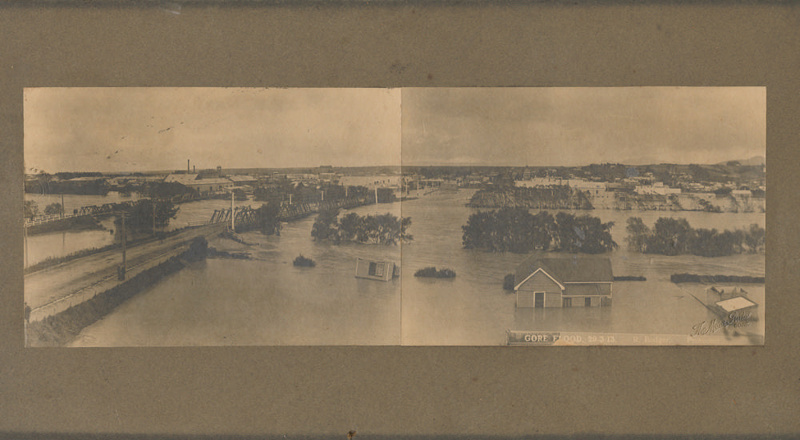 Photograph showing Gore inundated during the 1913 Mataura River flood, taken from the east bank of the river just upstream from the road and rail bridges. Known as the 'flood of the century' the river overwhelmed Gore with devastating speed, the water level rose so rapidly that people had little time to protect their property or to evacuate to higher ground. Although there was no recorded loss of life the damage to property and stock in the surrounding district was extensive. Confidence in building took some time to return and was not restored until both the end of World War One and the building of flood banks.